The photograph captures a busy, highly organised scene - a rare close-up of insects in action. Possibly the most amazing thing about this year's winner of the Wildlife Photographer of the Year award was that it was taken in the dead of night. 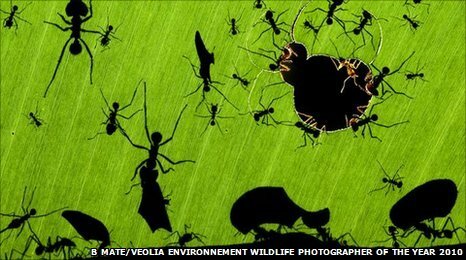 The judges commended winning photographer, Hungarian Bence Mate, for his "artistic" image, A marvel of ants. It will appear with 100 other prize-winning photographs in an exhibition at London's Natural History Museum. 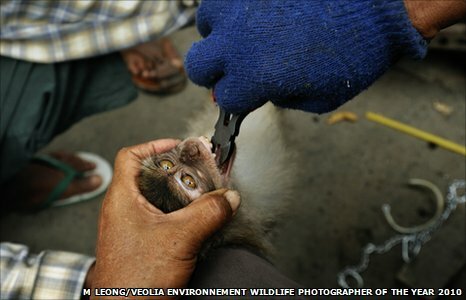 The tone of the 2010 Veolia Environnement Wildlife Photographer of the Year is subtly different to previous years. A new category, Wildlife Photojournalist of the Year, features stark images of the human exploitation of the natural world. The winner, Mark Leong, documented the multi-billion-dollar "wildlife product industry". His stark images included one of a black bear being "milked" for bile and another of a monkey having its teeth blunted before it was sold as a pet. But two overall winners, which included Young Wildlife Photographer of the Year, focused on the sheer wonder of nature. Mr Mate's winning image is taken from a portfolio which was chosen for the competition's Erik Hosking Award. This is given to the portfolio of six images that represent the best work of young, talented photographers between the ages of 18 and 26. It has not been awarded since 2007, when he last won it. Before the award was announced, Mr Mate, 25, told BBC News that it was his favourite image from his portfolio. "I like to photograph action and I can find very few examples of action in the macro world," he said. "This picture shows many different activities on the same picture - how [the ants] cut the leaves how they carry them - and the silhouette gives it something different." Mr Mate took the picture during a six-month expedition to Costa Rica. He became fascinated by the leafcutter ants but was somewhat frustrated to discover that they cut the leaves only at night. "This made my job very difficult... but then I had the idea of putting a flash behind the leaf." Fergus Gill, from Perthshire, was awarded the title Young Wildlife Photographer of the Year for the second year in a row. His image of a fieldfare, The Frozen Moment, was judged to be the most memorable of all the pictures by photographers aged 17 or under. Fergus, who is now 18 but was 17 when he entered the competition, concentrates on wildlife near his home and does most of his photography, including his winning image this year, in his own back garden. 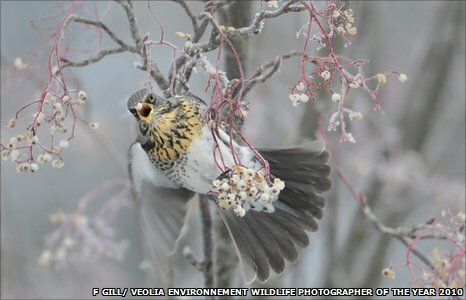 Wildlife photographer Mark Carwardine, chairman of the judging panel, said of the picture: "The hovering fieldfare is posed as an artist might paint it, the delicate yellow of the frozen berries echoing its breast feathers." He described it as "a winning gem of a picture". The competition is run by the Natural History Museum and BBC Wildlife Magazine. After its debut at the museum, which begins on 22 October, the exhibition will tour nationally and internationally.